Valves ? ?...not sure yet...stainless ? Was thinking about a Powroll stroker crank but after reading about the time delays people are having I've gone off the idea.Was also thinking about going to an electronic ignition but I got such a good boost in power from removing the alternator on my old bike I'd like to try the same setup on the 305. The motor will be going into a 74 Husqvarna 250 mx rolling chassis. sounds good but use a cush drive rear wheel or your gearbox will explode ..one of the mates has used a husky frame , looks good and light ..
What exhaust rocker are you planning on using? I would run the 2760 cam. Stainless valves will work well. Stock size 28.5/25mm? May have a new spring kit for you next week, better than RD Ti. Check back with me middle of next week. Run a 36mm Mikuni, it will work fine for your engine. Talk with me about exhaust. Do you know Sean Allanson? Hi Davy,....I'll be using a cush drive but want to use something lighter than the stock boat anchor setup. Am going with the Husky frame....it's a fair bit lighter and therés plenty of room for the motor.Would love a C&J of course but bloody hard to find. I have a nos exhaust rocker. I have no experience with Megacycle cams.I was going off the info on their site.The tracks I ride are mostly tight.....am in 3rd gear most of the time.....with the occassional 4th/5th gear straight. Will be using stock size valves.The head is being ported by a bloke that used to do the motors for HRC Australia. Let me know about the spring kit when you can. Exhausts ?.....well I'm not sure.I'm just looking for a nice well matched combination of parts.The pipe I run on the old bike is inch and a half/32 inch long header.....and the muffler tapers out to three and a half inches.I think it's a Bassani copy.Seems to work well. Motor is stock apart from 280cc piston and a 32 Mikuni. OK, couple of things going on. I have both a nice S&W Aluminum valve spring kit and a RD Ti spring kit. I have just checked both of them and they are right on the brand new spring specs for the kits. I will be selling both of them. But I also have some brand new Beehive valve spring kits that I have worked out. The Beehives are better than any of the dual spring kits for controlling potential valve float regardless of the rpms. Just a newer better design than the older dual springs. Nothing wrong with the dual springs but if you do some web research you will find that the Beehive designs are even better. With the 2740 MegaCycle cam you can run any of the valve spring kits. The Aluminum S&W would be a good kit for that cam. It is lighter than the Ti kit and has plenty of spring pressure for good valve control even on a fairly well modified 250. The Ti kit is recommended for the big cams because it has more lift space before coil binding. So you can run the big MegaCycle 12790 cam or the Johnson cam or the new Web cam that has recently come out and has more lift and duration than either of those big cams. The Beehive kit is the Maximum, uses oval spring wire for maximum lift clearance and is available with either the Cr-Mo collars or Ti collars. 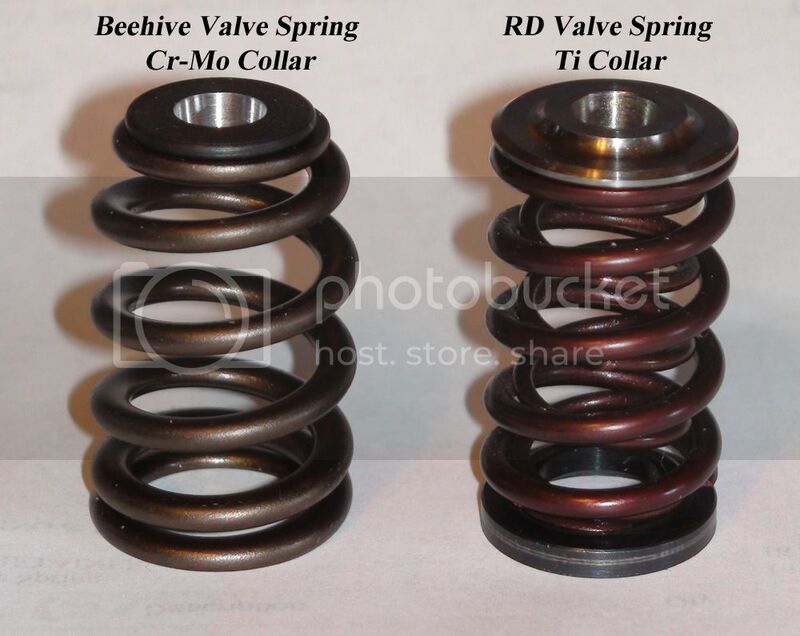 The Cr-Mo collars for the beehive springs is so small that it weighs less than the old style Ti kit collars. And it is really strong. So no real need to go for the increased cost of the Ti collars unless you just like "Trick" or have too much cash and can't stand it anymore. Swiss......have decided to go with the 2760 cam. Was speaking to the owner of a VERY quick hotted up 350 that I race against.....he runs that cam and is very happy with it. Do like the look of the beehive springs. I'll shoot you an email. Finally getting back on track.One more surgery to go. Swiss....my main computer crashed and I lost the emails you sent me.Am interested in the valve springs.Can you pm me the prices again. Looking for a cam as well. See Rickman post. Thank's........will check email when I get this bloody computer sorted out. HA!HA! Been fighting mine for months. Looks like I have a bad video card that has been Black Screening me! Borrowed a board and will have to pick up a replacement. Lost a 2 page document that I had typed out in recovering the system! Swiss ......I'll keep the motor stuff in this thread rather than mixing it with the Rickman thread. I'll take those RD ti springs if you still have them. (I'll send you an email). I have to build the stock frame motor first and won't be going too crazy with it. 305 kit. Megacycle billet 2760 cam and a mild port job. And an electronic ignition. 350 valves (if I can find some). How much do you think this setup would be held back using the stock 250 valves? Only found out recently that PVL make a complete ignition for the XL.......will look into it. Should be able to get that down to 105 kg.........231 lb with the mods I have planned. Keep in mind the 350 engine fits in the 250 frame just fine. I say this because I spent a lot of money on building my 250 into a 340 and then wished I had just used a 350 motor to begin with.You know if the pvl comes with a lighting coil or just an ignition coil? Yeah I know.......but I only have 250 motors in the shed so that's what I'm using. I think the 250 motor as a base has potential.....will be interesting to see how this one goes when it's done. Your 340 ? Powroll stroker ? Not impressed with the power ? Pretty sure the pvl is no lighting. No I love the motor well except for how much it vibrates now. The thing is its essentially a 350 motor just cost a lot of money. Thats what I dislike about it, the cost. I had the opportunity to buy a 350 motor for 125 bucks after rebuild it woulda been around 500 bucks. Thats way less than the over a grand I put into the 340 motor. Which still needs 350 valves and a port job. I remember when Honda announced the XR75 and then later the XL250. 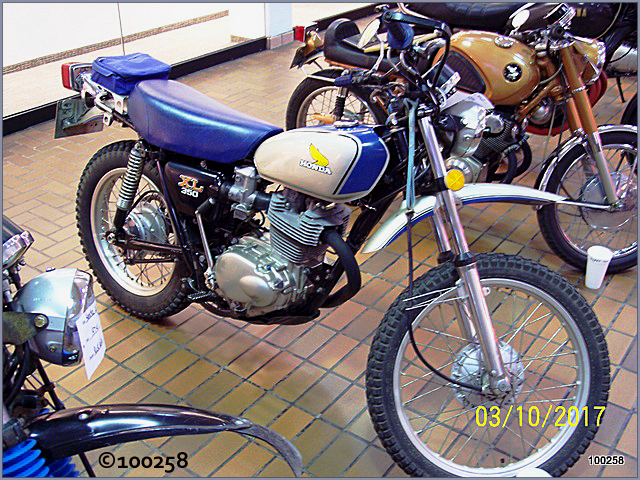 When the XR75 was first introduced there were nice glossy photos of it but no information about what size it was. A lot of people thought that it was a 125 or 250 until Honda finally released the Specs to the public. People went back to their Pursangs and Ossa and BSAs and such with disappointment! It was Honda's first bike with Knobby tires!! Then the announcement came that Honda was working on a Big Bike and everyone was talking 500 with a modern 4-stroke engine! Another disappointment, the XL with Trials tires, lots of weight and nice for some, street legal. No knobbies!! So a couple of years go by and various Performance/Race shops are doing bore jobs with Japanese Car pistons and welding the crowns for more compression etc... And Honda announces that it is going to release a Big Dirt Bike! More wishing and hoping and more disappointment! Trials tires, mild engine, 300lbs and street legal! Where is the challenge for the Racers to go against the other racing brands? So the aftermarket comes out with big bore kits and Powroll makes a real name for itself and C&J frames becomes a Racer's term for Performance, Honda Style! Basically the 350 was the best that the Japanese would send us until the TT500 came from Yamaha! Both the 250 and the 350 Honda engines were great platforms for performance, but within their class structure. Since they are almost the same engines design wise if you want a performance 250 and don't have class rules for racing that limit you, start with a 350 and add cam/carb/porting/exhaust etc.. And you will have much more than your 250 engine is capable of in comparable build layout! The 250 does have its place, IF you are limited to 250cc class or if your racing class is say 300cc limit etc... But once you start to go beyond that it doesn't make much sense to build with a 250 engine UNLESS you can get really involved in a $$$ build up! Pat Orman built a couple of Race 360cc engines that were great. At least one of them was, it had ALL of the good stuff and over 40hp from a BIG bore 89mm piston and a stock 57.8mm 250 stroke. That allowed it to rev fast and hard but the catch was that they were built to fit into a 360-400cc class structure. So if you want a great trail bike of medium displacement, start with the 350 and add a few parts to it. A 350 wouldn't have worked for Pat's 360-400 class because of the longer stroke and smaller bore keeping it from really cranking out the power. The 250 engine IS several pounds lighter than the 350 stock from Honda. One pound is for the magneto rotor, the 350 head is about 2lbs. heavier, the bigger fins on the cylinder make it heavier and misc bits and pieces here and there just add up. You can always use the TL250 magneto rotor on the XL350 and that will quickly take 2lbs off the engine weight, but the maximum engine weight loss that I have seen until my current engine build has been the EARLY Erik Cheney XL250 that he took just over 11lbs off of... Allen Greenwood's engine builder for Knobby Shop International also took about 11lbs. off of their 350/450cc Factory Race Bike! I am working on just over 12lbs. removed. Will let you know when I get the 490cc engine fully assembled with all the new parts.